TrKDD had the most liked content! 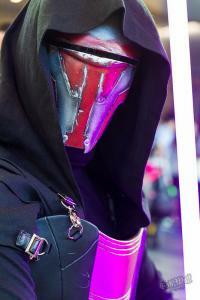 I'm going to start work on the same version of Bane once my Revan is finished and come Fall 2018. 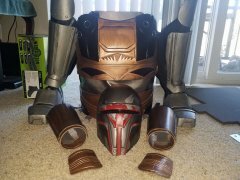 I'll be posting stuff my WIP in the Clone Wars - Bane section of the forum. I'm currently determining if the torso is either made of soft or rigid material. The collar is clearly made of rigid material as is the shin, vambraces, foot guards, hand plates, pauldrons, and the shoulder spikes on the collar. Everything else appears to be soft parts. The waist part looks to be made of soft material as it is shown to flow in the Clone Wars episode. 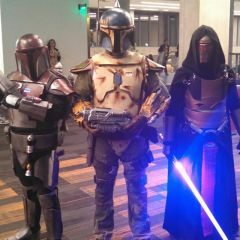 The overall costume is a fairly easy build. The helmet will be the most exciting thing to build as no available 3D model or sculpt of it exist. One person, however, did make a 3D model of it but hasn't made a physical copy or rendered it capable for 3D printing as of yet; that was 2 years ago. Update: Hood is finished. Gonna have to fix up the ends of the shoulder to make each side look even enough. Also going to add either a piece of velcro or a magnet to pull the hood back to make it lay properly. To do: New red sash. Replacing the hakama since the skirt isn't split. 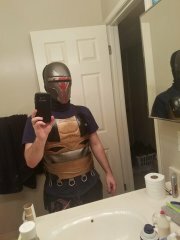 Modify the armor bridge length between the abdominal and chest pieces. The wide gap is making my legs look short. And lastly, probably add more length to the vambraces/gauntlets. Thank you! The approval process has been slow. Main reason I've been slacking on progress was because of school since my last post and my move next week. The hood is practically done at this point. Just need to attach the hood to the armor and check if I'm missing anything from the references I have of the figure. 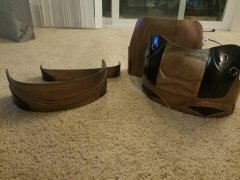 I plan to add updated photos with everything put together. What DarthValkyria clarified. The hakama I have (pictured) is a split type. 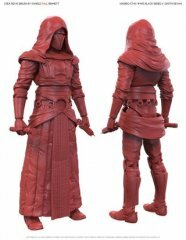 However, the black series Revan doesn't have a split skirt but a non-split skirt/robe. This is something that I will have to change in the future along with the ribbed armor bridge. Thank you! Looking to put my application in once everything is fully finalized. I have also spoken with my local GML a little bit about this project. Majority of the stuff was hand made by me. The fabric stuff was assembled by a friend of mine, so I don't physically have the patterns on hand, though I do plan to remake the soft goods in the future with my own patterns. The hakama was an online purchase. I removed the usual attachment for the hakama and basically added suspenders to them to hold them up. The shirt is just a turtle neck with different sleeves that I sewed on. 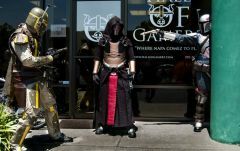 All the rigid armor pieces were made by me with templates that I have drafted and updated over the years: boots, gauntlets, hand plates, upper body armor (front and back), O-ring, belt detail, etc, etc. I also made the mask. Hello, everyone! 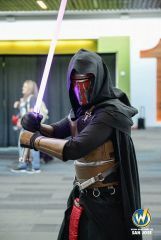 I've been lurking on these forums for quite sometime and decided to finally post a thread about the Revan I have been working on for about a year. 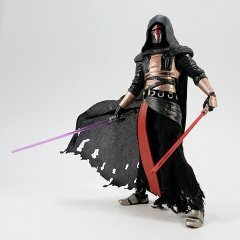 I've been working on a Black Series Revan since Jan 2017. All rigid parts are made of 3mm PVC foam (sintra). 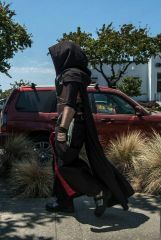 Somethings that I still need to do: hood, adjust the split skirt, ribbed cuirass, the piping on the shirt by the collar, and I'm positive that I'm missing something else. I always notice that I'm missing something when I look at the references that I have. 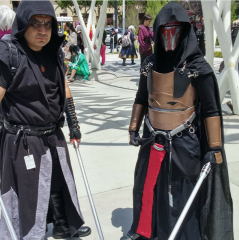 Here's a current photo of the Black Series Revan kit (left). The photo on the right is an older photo with a small O-Ring. The pants in this photo as well are no longer being used and instead I'm using joggers pants to remove bagginess. Trying to make everything as slim as possible and avoid baggy areas where there shouldn't be any bagginess. 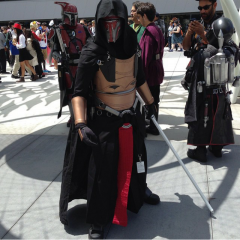 Version 4 of my Revan. Oh, I completely understand that. 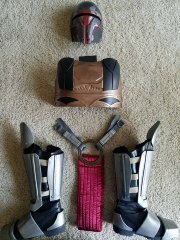 Looking at the references, the only KOTOR addition that I have added is the red piece of fabric on the abdominal armor. 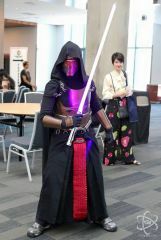 I have no plans to go for KOTOR Revan, but I do plan for Black Series Revan as it is my primary reference. I scrapped the idea of the gentle giant addition. 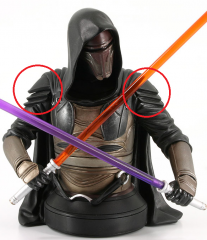 It is primarily based off the Black Series figure. 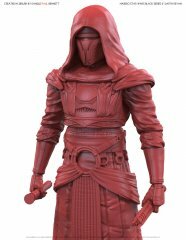 But it also has added elements from the Gentle Giant mini bust (shoulder pads on the hood) and the KOTOR Revan (red fabric strip on the abdominal plate). I've also decided to go with divided Hakama for this build. The Black Series, as I'm sure you know, isn't a divided Hakama. 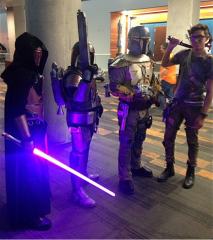 For my new version of Revan, I'm using a long sleeved turtle neck and dickies long sleeved work shirt. I'll cut the long sleeves off of the turtle neck and sew on new sleeves from the dickies long sleeved work shirt. I use BigWater's. 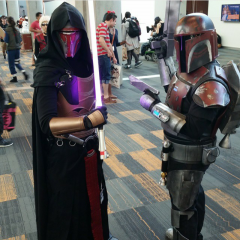 What I have experienced with wearing my Revan compared to my Mandalorian is that wearing a headset hurts. What I have tried is sewing velcro on one of the side straps of the mask and attaching the other side of velco to the mic and just attach it that way. I've also tried installing the mic in the helmet like how my Mandalorian helmet has an installed mic. The velco option worked much better than the installed mic. 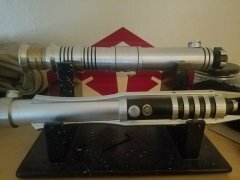 As for where to put the mic box I painted my mic box similar to the color of my armor and attached it with velcro to the bottom back plate. Definitely do the reborn. Reborn version looks much better than the other SWTOR version. I plan to make a Reborn as well in the near future. I don't know unfortunately, but I have seen approved members with BW's mask. I have two of Bigwater's mask, the regular and ultimate. Both are amazing and comfortable on me, I'd suggest the ultimate. That one is my favorite.